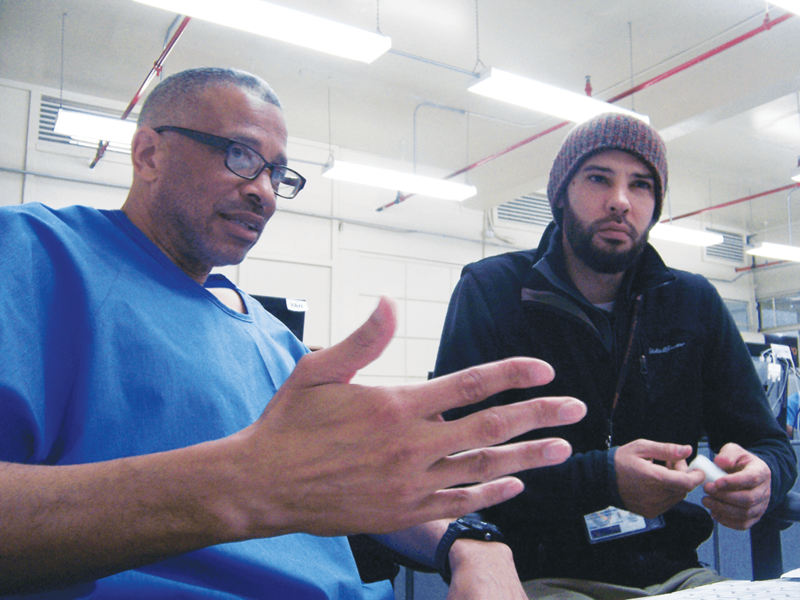 In spite of the monumental challenges, Jon Gripshover, a supervising instructor, without fail, walks to a classroom in prison industries four times a week to teach incarcerated men computer coding. Why is he so committed? He said working in prison has been the most challenging, yet rewarding, job that he has ever had. According to Gripshover, the program not only teaches coding, it also teaches new ways of thinking. “We teach methods to work your way out of problems,” Gripshover said. On the day of the April 3 interview, he walked from his office and into a brightly lit classroom of about two dozen incarcerated men sitting at desks with double-screen computers. Lines of numbers and figures filled their computer screens — others had programs running. Gripshover stepped on an elevated platform. The men stopped typing and conversing to hear his announcement. Gripshover planned to show the Slack executives three programs that the inmates developed. Iris is an automated tax filing application; Geek Sheet is an e-commerce cite for people who like purchasing “geekie” items, like Star Wars memorabilia; and Jolt is a localized search engine (like Google) dedicated to educational computer networks. “This is an opportunity, not only for you, but for what this class represents — that you are not just criminals serving time, but you are also a good resource for Silicon Valley,” Gripshover said. Falcone sat at his workstation, working on “The Challenge of the Day,” which is a coding problem Gripshover gives the students to solve. 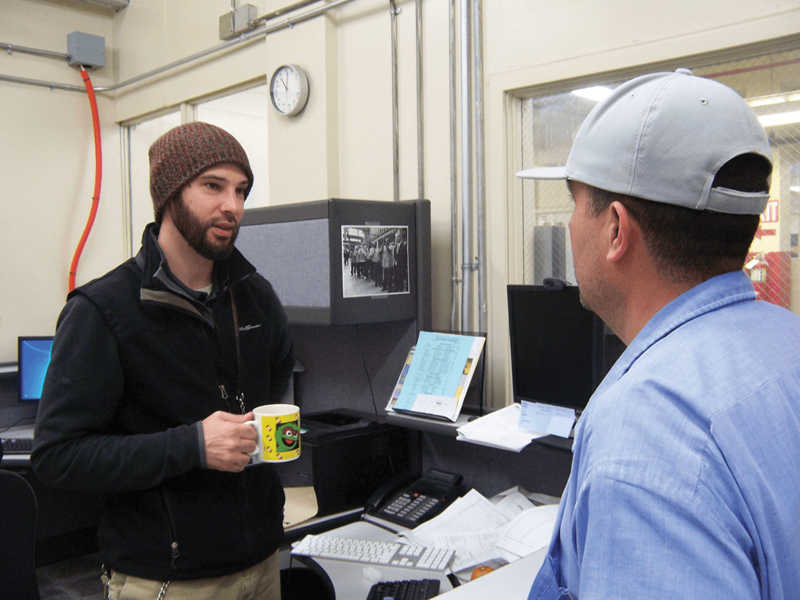 The program, called Code.7370, is an innovative technology-training program that began in 2014 at San Quentin State Prison. It is the brainchild of venture capitalists Beverly Parenti and Chris Redlitz. The duo teamed up with the California Prison Industry Authority and California Department of Corrections and Rehabilitation to manage the program. Gripshover said when he took this job, he was told that not everyone would pass. But, that was against his “no child left behind, no matter what,” philosophy, he said. “I am the kind of person who takes people where they were at,” Gripshover said referring to the time when he worked with at-risk youth. He said, however, getting youngsters out of crisis didn’t solve their overall problem. It always turned into, “what next?” Gripshover said he felt education was key to success. Code.7370 provides teacher’s aides to assist struggling students. The TAs graduated from the program. They crosscheck with the struggling students to ensure that all the resources provided in the curriculum have been exhausted. If the TA is unable to solve the problem, Gripshover steps in. If all else fails, Gripshover does internet research through a website dedicated to coding problems. TA John Levin said, “Jon makes sure that we are given the latest and most current materials. It is a self-paced class, where there are different tracts, which allows people to progress at their own pace.